When it comes to magic, you need a combination of professionalism and charm to win over your audience. This involves never performing the same trick twice and of course, never revealing the secret to your trick like how Lennart Green does it. But what about fellow magicians? Usually, if another magician or illusionist is watching a performance, they’ll know exactly how the magician is working his/her tricks. However, when fellow magicians watch Lennart Green, it’s an entirely different story. Lennart Green is a Swedish magician, highly known around the magician community and fellow professionals for his card trick abilities. Throughout the years, Green has been a doctor, a nurse, an assistant gymnastic professor, and violin crafter. However, out of all his many hats, he wears his magician hat the best. Lennart Green is widely known for his more disorderly magic performances which are both unique and entertaining. Many claims that his skills and showmanship are unlike any other magician’s, making his shows awe-inspiring for even the most talented magic professionals. We will discuss who Lennart Green is, his tricks and reviews of the products he offers to help you become a skilled magician yourself. It was a show in 1988 that helped Lennart Green rise to the top of magician kingdom. This was when he was performing magic in close-up style for the judges at the FISM convention. This event, for all of you who aren’t familiar with magician competitions, is the cream of the crop and takes place every three years. Lennart amazed the audience with his close-up card trick but then was disqualified under suspicion of using stooges in this act. This is because the trick Lennart performed was deemed impossible, so the judges assumed he was cheating. Lennart called a volunteer up on stage and asked them to shuffle his deck of cards, however many times they wanted. The assistant was asked to name a card, and amazingly, Lennart took the card from the deck. The judges couldn’t believe it, so they immediately disqualified him. Lennart continued performing as an amateur magician for years, despite his protesting and pleading with the judges. Three years later, at the same convention, Green entered the close-up magic competition with the same trick. The only difference was this time he invited the judges and their assistants on stage to perform his unbelievable trick. So, just as before, he asked his assistants (now judges) to shuffle his pack of cards. Again, the trick worked magically, apologies were made, and Green was awarded first place. Enabling him to become a professional magician at last. Ever since this convention, Lennart Green has become very well known for his lectures and magic tutorials among magicians and fans. These talks and showcases have become so popular and are so well done; he was invited to record one on TED talks. Since Lennart Green’s feat at the FISM convention competition, he has created a range of different tricks and products for his audience, fans, and fellow magicians. We will outline some of the best products and tricks Lennart Green offers, followed by reviews of some of our favorites. With this trick, the skilled magician Lennart Green starts with the basic trick of the Gemini Twins with a normal deck of cards. Green takes this trick to a whole new level by adding two revelations. A plot and a deck of unique, custom-made cards. This is a self-working trick which means there’s no sleight of hand tricks needed. The cards that he includes and of course, the presentation, provide incredible performance. There are some other effects that are similar to Stolen Cards, while not the same. One card trick called the "Kaleidoscope Cards" by Daryl is very similar and also includes a custom-made deck. This assemblage of a custom card deck and magical DVD performance is hard to beat. Lennart Green is a unique magician with originality that comes through his comical and amazing performances. He was well-loved and desired all over the world. An example of this is his appearance on NBC’s World’s Greatest Magic. Not only was he chosen to appear on this great show, but the outcome was amazing —everyone loved him. Through this DVD set, Lennart uses his unique skills to teach aspiring magicians and his fans how to become a magical being. This volume includes the F.I.S.M act which is the act that made Lennart Green famous around the world. Included in this act are disappearing glasses, the laser deal, separation of colors, appearing glass of liquid, and a full deck separation straight from a shuffled deck. You’ll also find in this act, Lennart’s blindfolded ace through to king production. While this part is shown as performance only, you’ll be able to learn techniques and parts of this routine throughout the three-part set. This act also includes a large number of sleights, providing one of the greatest assemblages of unique card material available. Lennart is truly one of a kind, and this fact comes out in Classic Green Volume 2. Lennart can do tricks with a deck of cards you wouldn’t believe. Because of his incredible card magic and his wonderful sense of humor on addictive performances, the world has sought after him. A World Champion of FISM and featured magician on NBC’s World’s Greatest Magic. Lennart is a world-class entertainer and magician with more than just a few unique tricks up his sleeve. In volume 2, you’ll get background information and insight on his tricks, The Poker Deal, Deceptive Perception, The Temple of Shiva, The One-Two Separation, The Swedes Deal, Fale Angle Riffle Shuffle and more. 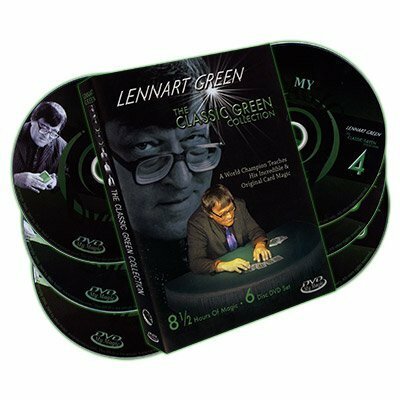 Volume three of the six-volume set of DVDs provides more wild magic that makes Lennart Green a world-class entertainer and magician. You’ll be able to gain insight into his most famous routines and techniques created to blow up the minds of his audience. In Volume #3, you’ll find the background information and insight into his tricks, Fractal Harmony, Impromptu Royal Flush, 2nd Birthday Gift, One in Fifty-Two Bet. These and many more amazing tricks to learn from and practice into your magic routines. One of the highlights in a Lennart Green performance is when he consistently separates the aces into a red or black order and a new deck order. In these DVDs, he displays the many methods of using and accomplishing this trick. Along with this, you will also learn about his love of false shuffles and cuts while learning all the techniques needed to excel at these tricks. In this specific volume, he outlines Introduction to False Shuffles, Mirror Shuffles, MCavakacade of False Shuffles and Mirror Cross Shuffle. To finish it off, Lennart Green has two more volumes to this 6-part DVD set. In these parts, he uncovers more of his incredible tricks, how to master them and the techniques behind their wonder. Lennart does unimaginable things with cards. Although he is well known for his wild looking card magic; he is also passionate in mathematical principles. And he incorporates them in his card routines. On this DVD, you’ll find some of this magic that’s self-working, easy and well-explained. This set was produced in Portugal by Luis de Matos and includes a four-disc DVD set that includes all of Lennart Green’s creative catalog. In this set, Lennart reveals the secrets behind professional and award-winning acts, including ten routines, 35 sleights, controls, and flourishes. Along with this valuable information and material, it also includes two hours worth of interviews by Luis de Matos as he interviews Lennart Green about his work, magic, and life. These interviews provide insight into one of the most respected and admired magical performers of all time. Through this, Lennart talks about his early influences, his love of magic, music, and puzzles. This set is subtitles into six different languages: French, English, Portuguese, Spanish, and Japanese. a performance at the Baroque Library at the University of Coimbra which is Green’s professional act that has taken him all over the world. It fully explains every trick, every tint tip and line of the pattern. You can enjoy the full performance as well as become amazed by the explanations behind the tricks. Car separations, special moves, cuts, and shuffles. In this disk, Green takes shuffled cards and amazingly restores them to the regular order. He tells us all about his techniques, stunning products, secret false shuffles, and everything you need to know to become a magician like him. Lennart's favorite close-up routines: Stonehenge, The Terrorist, Two Dragons, Something Happened and many more. These are all featured and explained which will have magicians loving his poker routines and tricks. Poker Routines, Three Shell Game, Coins Through the Table, Origami are all included in these routines that will have your crowd roaring. Green performs dozens of tricks and sleights and moves in this DVD set, one of the finest you can find. Lennart Green is world famous for his unique and comical performing style and brilliant tricks and thinking behind his performances. 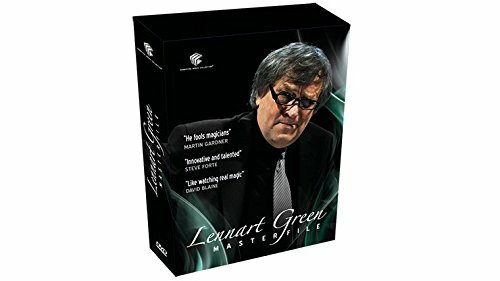 In these DVD sets, you’ll have an inside look at Lennart Green. What makes him world famous and how he sets up his tricks to amaze his audiences over and over. People love Lennart’s performances due to his comedic and unique way on stage. As mentioned before, Lennart Green can trick anyone in his audience, whether he’s performing for judges or professional magicians. He is original, smart and comedic which is why millions of admirers continue to look to him for inspiration and entertainment. Out of all the products Lennart has produced, Masterfile is by far our favorite, as it is others. You can buy the product on Amazon, or you can purchase it on Theory 11. Out of 68 ratings on Theory 11, this DVD set has received an average rating of 4 ¼ stars which is pretty impressive. On Amazon, this DVD set has received five stars out of two reviews. Overall, we think Lennart Green has deserved his fame and admiration. He is a fantastic magician with a flair for amazing people with his skills, vibrancy, humor, and amazing stage performance. His true colors come through when performing, showing true passion for what he does. We highly recommend learning from him as it will mean learning from one of the world’s absolute best card magicians of our time.